Answer: No more than necessary – there is no rush in most cases. Answer: Minor work, yes. Large limbs, especially those still connected to the tree can be very dangerous. It’s best to bring in the professionals. Answer: No – the damage heals faster and better if left exposed to the air. Tree Trunk Goop is the exception because it helps the wounds and weathers off quickly. Tree Trunk Goop - here’s how to make it or purchase it. Firewood – will it spread disease? Answer: In general, no problem. 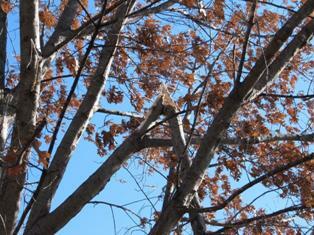 Oak wilt diseased red oaks are the exception. Answer: Annual thinning of trees may actually cause more than less damage. Minimal, careful pruning that maintains the natural character of the tree is almost always the best. 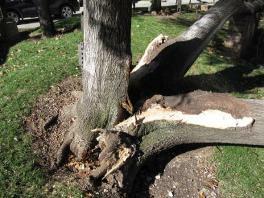 Your damaged trees will fair better if you apply the entire Sick Tree Treatment right away. 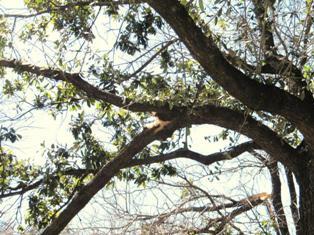 These big hanging limbs can be dangerous for the homeowner to try to fix. If you cut these hanging limbs off, they might fly right in you face. Hire an arborist. On a related issue, here's why I normally don't recommend multitrunked trees. 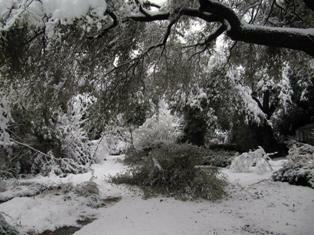 They tend to fall apart at some point, especially when loaded with ice, snow or wind. Find more information on living a more natural organic lifestyle at DirtDoctor.com. Visit the Organic Warehouse for the best natural organic products for your health and gardening needs.